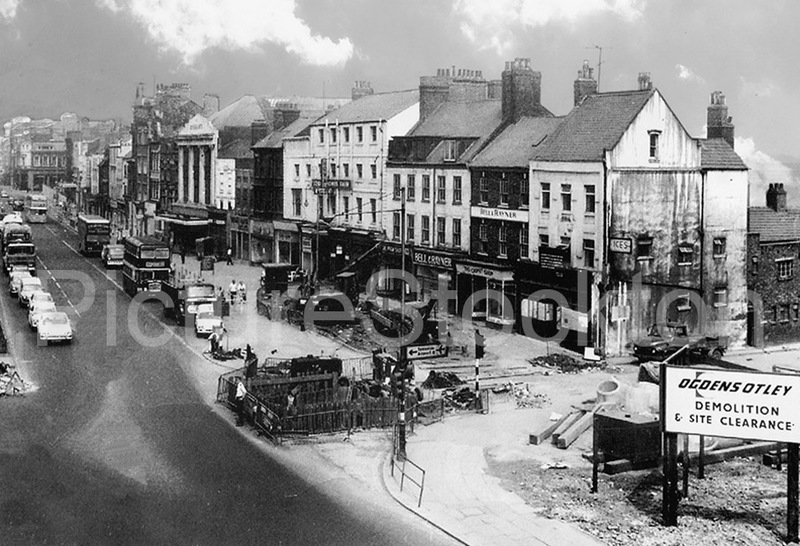 This photograph shows the stretch of Stockton High Street from Castlegate to Finkle Street, the buildings are empty and awaiting the bulldozers.The Georgian town houses from Castlegate northwards have had their ground floors converted to shops, very similar to those seen in Yarm to this day, the Greek Neo-Classical frontage of Doggarts comes next, then more town houses, all of this was swept away and replaced by the Castlegate Centre. I noticed the building behind Doggarts facade has a hole in the roof and its design is more like an aircraft hanger than a shop. The small house along Castlegate looks to be more Victorian as were a lot of the old buildings and yards alongside the quayside. What many commentators have overlooked is York, Guildford, Lewes and Norwich, have all kept their old shop frontages and streets and have prospered, these quaint towns and many others are now tourist attractions. I view the Castlegate Centre has being conceived as a property developers goldmine project which never quite clicked with the public or traders. The destruction of that part of the High Street and it’s replacement with the Castlegate Centre was an act of architectural barbarism. Very sad. The destruction of that section of Stockton High Street and it’s replacement by the banal Castlegate Centre was a nail in the coffin of Stockton. I visited the High Street a couple of years ago – it was basically dead mid week (there was some shopping activity inside the Castlegate Centre). With the present decline in city centre shopping nationwide Stockton High Street is not going to recover. We can’t live in the past – time to move on. The mutilation of an iconic northern town. The 60s was great but, not the town planning. So easy to comment after the event, I was about 10 yards from one of the white buildings when it collapsed with no help from Ogdens. Luckily they had put a fence along the front and it was a quiet day, no one was hurt. People who did not go through the war or the Austerity afterwards which meant money was not forthcoming for anything other than they clear and rebuild as cheaply as possible cannot know the mindset at the time. The back of those buildings down to the river was a virtual bomb site it had been partly demolished before the war in the start of the clearance for the whole area which stopped on the run up to war then became derelict, those of us who had to work along that area hated it, we knew it had to be cleared but as i said there was no money as the UK paid off its massive war debts. The cost of probably having to take down what had once been Town Houses then rebuild the fronts as they once were would have been astronomical way beyond what any town could afford. It also ended up with some of those developing the area in Jail. I suppose there were people who decried the removal of Roundhouses and the erection of brick houses you cannot satisfy everyone. Those who decry the demise of the High Streets of most of British Towns probably use the out of town markets and online outlets even I do that at my age so we cannot blame anyone but ourselves for the changes, which by the way I think are great. But that is my opinion, OK I will get my coat. As a PS there was a tripe works down Castle Gate Wileys who had a stall on the market for years, tripe was un-rationed so became a weekly meal, tripe and onions gently cooked in milk with lashings of home grown onions was a big help to many families. I wonder why the deep hole there in the foreground?? What a crying shame that those buildings were demolished. Just look what was put in their place. The old high street had character. The new castle arcade should have been constructed at the riverside or around Tenant Street area. They should never have demolished those old buildings, they removed so much of Stockton’s history. SHAME ON THE COUNCIL OF 1970! Great photo. I used to wander down from Roseworth and roam this part of the town earlier in the 60s. There used to be a kitchen of sorts in Castlegate, part way down on the right. I remember big doors open to the road with what I think was vats of tripe being cooked.